LONDON -- President Donald Trump touched down in Britain on Thursday, where he will get the red carpet treatment on a brief visit: Military bands at a gala dinner, lunch with the prime minister at her country residence, then tea with the queen at Windsor Castle before flying off to one of his golf clubs in Scotland. But trip planners may go out of their way to shield Mr. Trump from viewing another aspect of the greeting: an oversized balloon depicting the president as an angry baby in a diaper that will be flown from Parliament Square during what are expected to be massive gatherings of protesters opposed to the U.S. leader's presence. Rarely has a foreign leader been so mocked on an official visit -- London's mayor, a Muslim who has challenged Mr. Trump's world view -- okayed the balloon, which is an apt symbol of Mr. Trump's tempestuous relationship with Britain, traditionally the United States' closest ally. 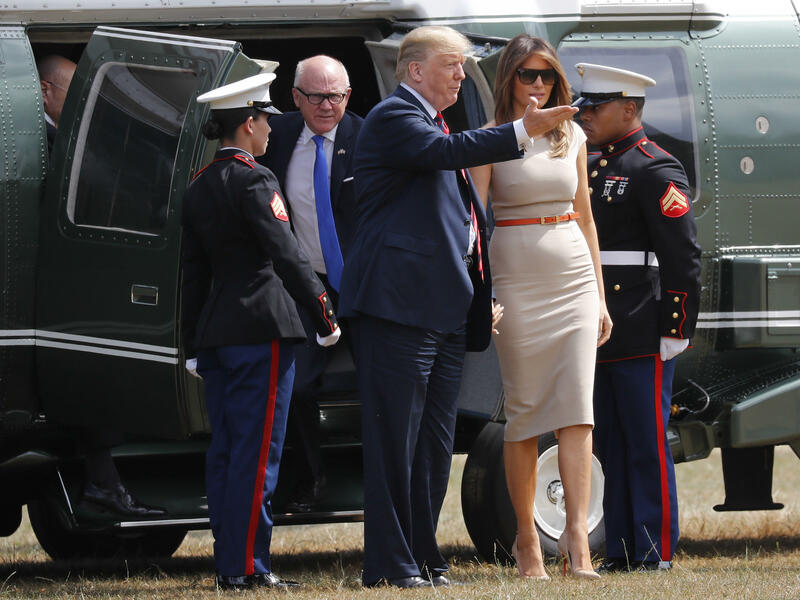 Mr. Trump arrived from Brussels on Thursday at Stansted Airport, north of London, before boarding his Marine One helicopter for the short flight to Winfield House, the U.S. Ambassador's residence in the center of the British capital. Thousands of protesters were expected to gather outside the luxurious residence later Thursday. But it's not simply the protesters, who are expected to dog Mr. Trump throughout his visit, including his weekend in Scotland, but his fraught relationship with political leaders accustomed to harmonious exchanges with U.S. leaders, a tradition of unity that goes back at least to the vital World War II partnership of Franklin D. Roosevelt and Winston Churchill. Mr. Trump may have ruffled feathers again when he said just before departing for Europe that the U.K. was in "turmoil," suggesting it was "up to the people" to decide if Prime Minister Theresa May remains in power after a few days that saw her authority challenged by the resignation of two prominent Cabinet ministers protesting her Brexit policy. He has clashed in the past with May -- even though she is a fellow conservative who shares his view that defense spending should be hiked -- and with her predecessor, David Cameron, who challenged Mr. Trump's anti-Muslim campaign stance as "divisive, stupid and wrong." Labour Party legislator Paul Flynn, who has criticized Mr. Trump in Parliament, says the U.S. leader has outraged Britons -- and people around the world -- with his harsh treatment of immigrants. "Give us your weary and your oppressed and we'll divide you from your children," he said mockingly of Mr. Trump's policies. "It seems so un-American. We greatly respect America as a generous place built up by immigrants over the years. People see him as a cheap huckster who happens to have an office we respect as president of the United States." Mr. Trump, however, suggested before leaving a NATO summit in Brussels on Thursday to head for London, that Britons in general agree with his policies, in particular his tough stance on immigration. Asked in Brussels about the massive demonstrations expected at the next stop of his European trip, Mr. Trump said it was "fine" that there were protests planned. London Mayor Saddiq Khan, who approved the "Trump baby" balloon flight, released a statement on Thursday ahead of the protests, warning that anyone intending to come and break the law was not welcome. "I know Londoners are resolutely opposed to the politics of fear and despair. The US has always stood by our side as a beacon for tolerance, openness and respect. This protest is not anti-American – far from it. Most of those marching on Friday will love the United States, just as I do," Khan said. "But having a special relationship means that we expect the highest standards from each other, and it also means speaking out when we think the values we hold dear are under threat." Mr. Trump angered May and many Britons by tweeting inflammatory and unverified videos made by Britain First, an anti-Muslim group whose leaders have been convicted of hate crimes, and by characterizing parts of London and other cities as no-go areas because of a purported Muslim-related crime wave. Top it off with the introduction of trade policies that have targeted some European industries -- even though European nations are longtime friends accustomed to easy trade with the United States -- and it is not surprising that Mr. Trump's itinerary will keep him out of central London on Friday, when large protests are planned. The U.S. Embassy has even warned American citizens to keep a low profile during the visit because of the planned protests -- the sort of warning usually issued in more volatile locations. Mr. Trump has been quick to criticize British society, telling an NRA convention in May that the British didn't have guns but had so much knife crime that one hospital was like a military war zone with its floors awash with blood -- a statement quickly rebutted by British physicians and politicians. The antipathy between Mr. Trump and segments of the British public started during the 2016 presidential campaign, when Mr. Trump called for a temporary ban on Muslims entering the United States. That led roughly half a million people to sign a petition calling for him to be banned from entering the U.K.
British law requires any petition supported by more than 100,000 people to be considered for parliamentary debate, even though there was no serious attempt to prohibit Mr. Trump from coming to Britain. Still, lawmakers have had no qualms about publicly calling Mr. Trump a demagogue and a fool. It was an extraordinary rebuke from a close ally. Prime Minister May has abundant reasons to seek a close relationship with Mr. Trump -- not least, the United States will be an even more vital trade partner once Britain leaves the European Union next year -- but it is an uneasy embrace, given her opposition to many of his key policies. May reached out to him just days after Mr. Trump was inaugurated, extending the invitation for a coveted state visit that would be hosted by Queen Elizabeth II, but that gesture has proved far more controversial than expected as Mr. Trump has shown little interest in maintaining "diplomacy as usual" with European allies. The state visit was never actually scheduled -- there has been fierce opposition to it in many quarters of Britain -- and this trip is part of a working visit instead, meaning among other things that Mr. Trump will overnight at Winfield House, the U.S. ambassador's handsome residence near Regents Park, rather than at Buckingham Palace or Windsor Castle as a guest of the queen. Winfield House has one of the largest private gardens in greater London -- but it won't be possible to see the "Trump baby" balloon from its grounds.